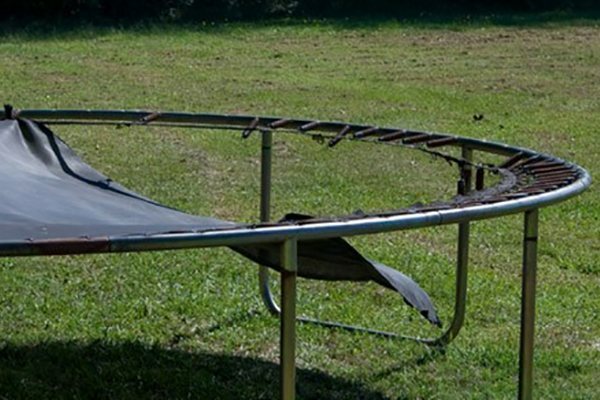 How and Why do Trampolines Break or Rip? » How and Why do Trampolines Break or Rip? Tramp Fence Law: Can You Have a Trampoline Without a Fence? Why Is My Trampoline Turning My Feet Black? Can You Put Soap On a Trampoline to Make a Slip ‘N Slide? Bouncing on a trampoline is by far the most fun outdoor activity there is. If you own one, you know exactly what I’m talking about. As soon as summer arrives, I’m willing to bet you spend hours on end bouncing and doing amazing tricks on your trampoline. On the other hand, if you don’t have one, but you’re considering buying one, then you need to be mindful of several things. Namely, if you choose a trampoline that isn’t top-quality, there’s a good chance you’ll end up breaking or ripping it. In short, yes, a trampoline can break. Basically, if the frame isn’t heavy-duty, then it’s bound to break over time, especially if you use your trampoline every day. That’s why you need to take a good look at the frame before you end up buying it. What's more, some manufacturers tend to make frames that aren’t properly treated for weather exposure. Obviously, since your trampoline is in your backyard, the material will deteriorate over time. I’ve seen far too many trampoline accidents, so I can only suggest that you check and then re-check the frame before purchasing it. Also, galvanized frames are the sturdiest, so keep that in mind. Furthermore, you need to make sure to check how much weight a trampoline can carry. I’m sure you know how dangerous it can be if the frame breaks mid-bounce. It’s always better to buy a trampoline that can carry a lot of weight. Now, you probably think that the more weight it can carry, the more it will cost. Although this may be true, if you’re truly set on buying a trampoline, there’s no room for budgeting. Trust me — you’ll actually end up saving money if you go for a quality product. There are several reasons why a trampoline can break. 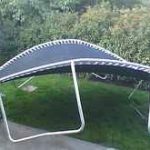 Since I’ve already covered the frame quality, let’s talk about why a sturdy, heavy-duty trampoline can break. These are just a few simple things you can do to ensure that your trampoline doesn’t break. When I bought my very first trampoline, I must admit that I was a bit lazy with the maintenance. Unfortunately, I learned the hard way that this was a huge mistake. I was lucky enough to land on my feet, but I really could have injured myself, since my poor trampoline practically broke in half mid-jump. Needless to say, I’ve learned my lesson, and I do a quick check-up before and after I use it. How Does a Trampoline Break? It’s simple. A trampoline can break in more ways than one. Namely, the frame can collapse, or a screw can come undone, causing some of the parts to break. 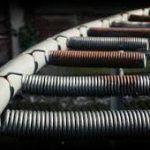 Furthermore, over the years, the springs are bound to stretch out, or even rust due to weather conditions. Luckily, quality trampolines come with a safety pad that protects the springs and keeps them from rusting so quickly. As I mentioned, it’s important to buy a heavy-duty trampoline from a trusted manufacturer. That way, you can easily order new parts if you notice any rust on the springs or the frame. How Does a Trampoline Rip? Yes, trampolines can rip as well. In fact, there are several reasons why that can happen. Basically, safety netting is incredibly important, and the best material is tightly woven UV-resistant polyethylene or Terylene. Moreover, the best trampolines have secured netting around the inner rim of the springs. Unfortunately, it’s not uncommon for a trampoline matt to rip. Harmful UV rays, frequent use, and cold weather play a big part when it comes to wear and tear. The best way to prevent that from happening is to do a quick check-up before and after you use your trampoline. As soon as you see even the tiniest rip, you need to fix it as soon as possible in order to prevent further damage. Weather conditions play a big role here. I keep my trampoline in the shade so that the sun doesn’t wear out the matt. What’s more, in the wintertime, I make sure to cover it up. The same goes for when it’s raining. Another reason why a trampoline might rip is that you’re putting too much weight on it. Make sure to check the weight limit, and never exceed it. It’s simple ― if you treat your trampoline with care, you’ll be able to use it for quite a while. 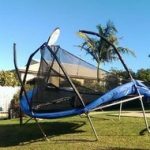 Hopefully, I’ve shed some light on how and why trampolines break or rip, as well as how to prevent these things from happening. The bottom line is that if you’re ready to buy a trampoline, you need to look for a quality product. If you’re buying online, it’s always a good idea to check some customer reviews before coming to a decision. If you liked this article, please share this post so that others can read it. Also, feel free to leave a comment and share your experience.